Start by steaming your cauliflower until fork tender. Then drain well because you don’t want any added moisture in this dish. In a large bowl mix together the cream cheese, sour cream, cheddar cheese, Monterey Jack, garlic powder and onion powder until smooth and creamy. Slowly and gently stir in the steamed cauliflower, bacon and chives. 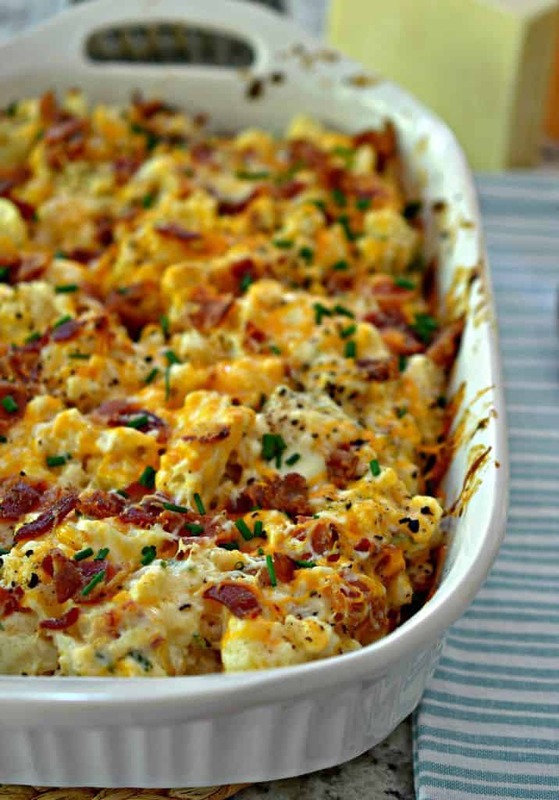 Spoon into a casserole dish and top with a little more bacon. Bake until the cheese is melted and gooey. Garnish with chives and serve hot. 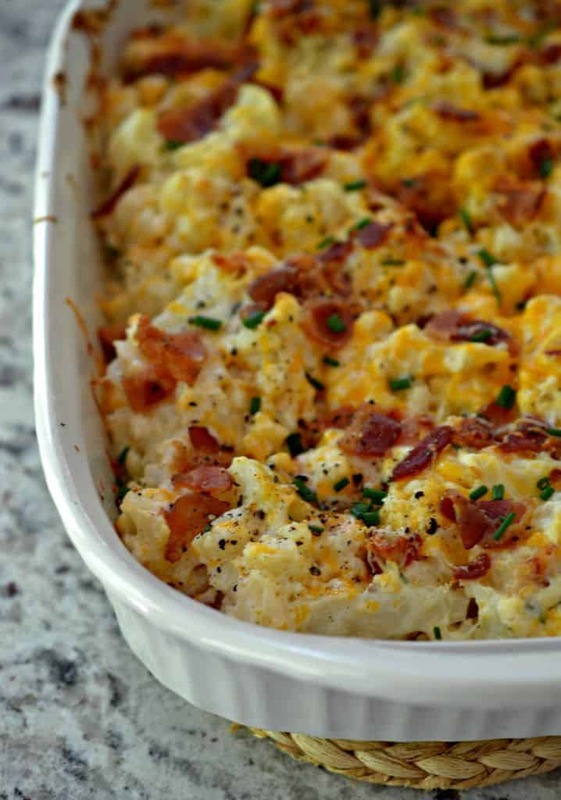 Helpful hints on making this Loaded Cauliflower Casserole the best that it can be. The cauliflower should be steamed until it is fork tender. I recommend the full fat sour cream, cream cheese and cheese for this recipe. It just tastes better with it. Fresh chives really make this casserole pop! They are worth the added expense and trouble. Season to taste with salt and pepper. I love lots of pepper on this dish. 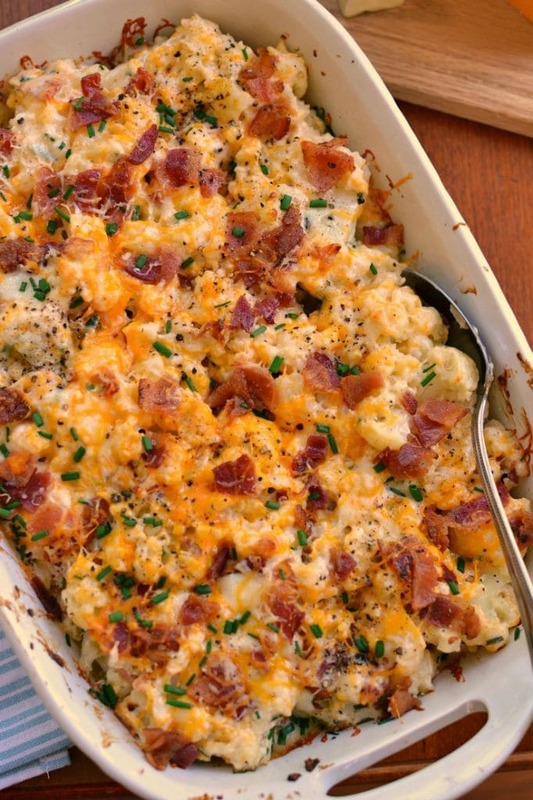 This Loaded Cauliflower Casserole can serve as a full meal. It really is very filling. Are you always on the search for new and original tasting veggies? No worries I will try to keep you covered on that front. Here are some of my favorites! Some are mine and some are from some of my favorite bloggers!! Put this delicious casserole on your rotation for the week. You and yours are going to love it. Enjoy my food loving friends. This one is scrumptious! This recipe was originally published June 5, 2018 and was republished February 17, 2019 with new content. 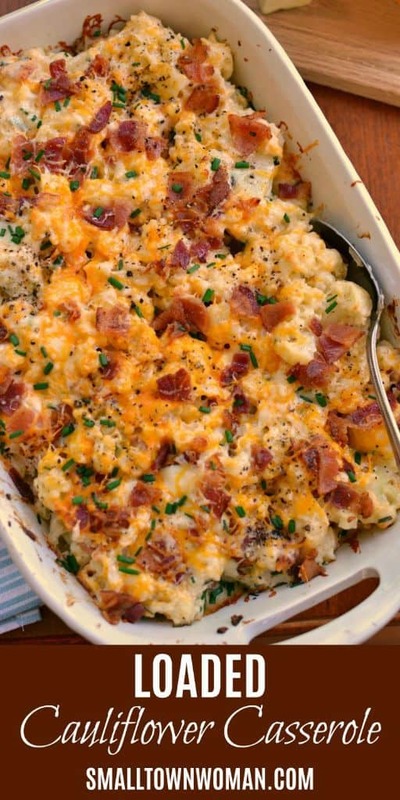 Loaded Cauliflower Casserole is steamed cauliflower combined with cream cheese, sour cream, sharp cheddar, Monterey Jack, bacon and chives. Steam cauliflower until fork tender; approximately 10 minutes. Drain well in colander. Preheat oven to 425 degrees. Grease 9 x 13 inch baking dish. In a large bowl combine cream cheese, sour cream, cheddar cheese, Monterey Jack, garlic powder and onion powder. Mix until creamy and smooth. Gently stir in cauliflower, 1/2 of the bacon and chives. Season with salt and pepper to taste. 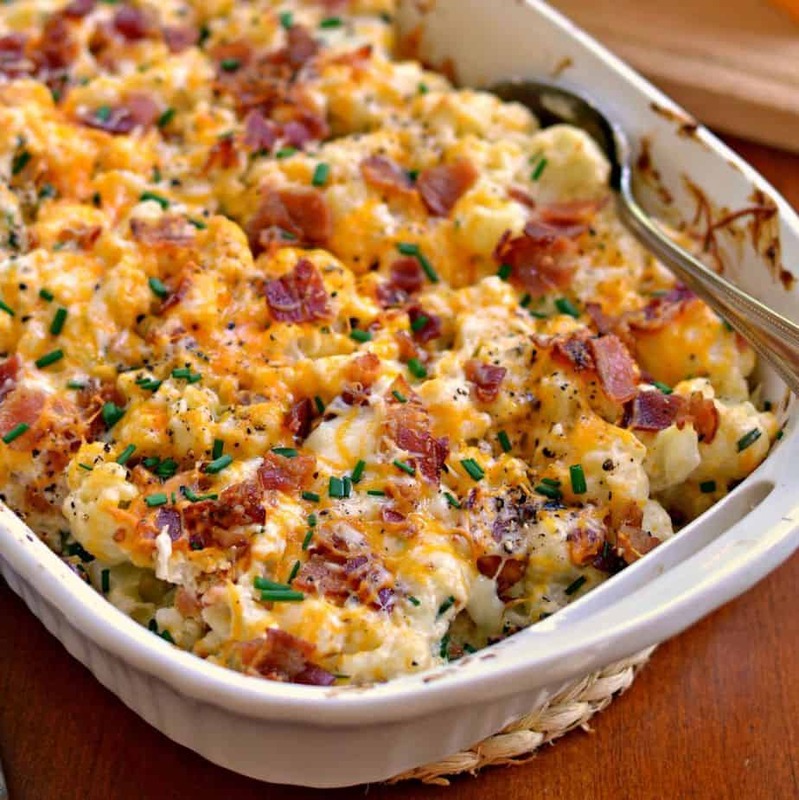 Spoon into casserole dish and top with remaining bacon. Bake uncovered for 20-25 minutes or until the cheese is melted. Top with remaining chives and serve. That is so cool. So glad that everyone liked it. You made my morning! Thanks so much! Made this for thanksgiving and it was so so so good!!! I initially made this side for my dad who has to watch his carbs so I cut the recipe in half. I’m kicking myself now because it was all gone and now I don’t have leftovers. Definitely will be making it again!! Thanks! Thanks so much Stephanie! I am so glad that you liked it! We love it too! That casserole serves eight with a little more than a cup each. You probably could make it go a little further by adding another lb of cauliflower. So glad that you liked it! Good improvising. A good cook knows how to do just that!! Made it for dinner. It is delicious! Thanks so much! We love it too! So glad that you liked it!! What is the net carb count and nutrition info? I added nutritional information on that recipe. That is the most information that I have. Do you think it would hold up to being frozen and then cooked later? Not sure. I am always hesitant on freezing vegetable casseroles. What is the total carbs? I added nutritional information on that recipe. Thanks so much. I am sure that it can be. I hope your recovery is quick. Loved this! Used cheddar and provolone, cause that is what I had on hand, so I would imagine almost any cheese combo would work. Thanks. Yes lots of cheese combos work! I hope you enjoy it as much as we do! Made this recipe twice so far. Second time I got distracted and forgot to add the sour cream. Both versions were a big hit. It’s one of my family’s new favorites. My husband asks for it often & is even willing to go get any of the ingredients I may need. Awesome! Thanks Carol! I am glad that hubby is willing to go get the ingredients!! Looks very good but I don’t like cream cheese can I substitute the cream cheese for something else instead? Maybe 1/2 cup mayonnaise but I have not tested that in this casserole. Let us know if you do. How about full fat ricotta instead? That would be equally amazing. I made it and thank you so much, it was delicious. Gonna throw some hamburg in next time to make it a complete meal…. Loved it! I am so glad that you liked it! That is a great idea. I made this for Christmas to rave reviews! It’s been requested again for Easter!!! 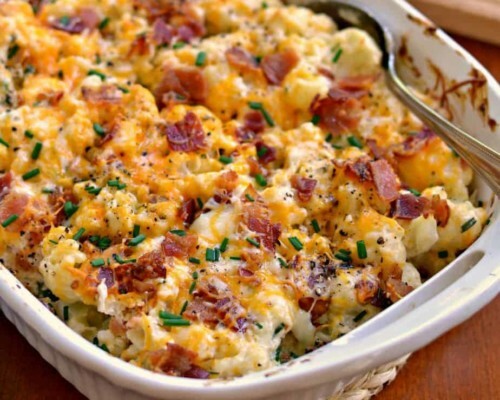 Not one who loves cauliflower but this casserole changed my mind! SO delicious. The best way to eat cauliflower!